One of two Border Policemen killed in the terrorist attack on the Temple Mount in Jerusalem. July 14, 2017 – First Sergeant Kamil Shanan was one of two Border Policemen killed in the terrorist attack on the Temple Mount in Jerusalem. 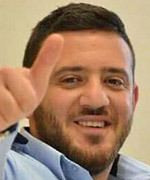 Kamil Shanan, 22, of Hurfeish, a Druse village in northern Israel, died of wounds sustained during his attempt to prevent a terrorist attack on the Temple Mount in Jerusalem. The attack was perpetrated by three Israeli Arabs, residents of the town of Umm el-Fahm. Kamil Shanan enlisted in the Border Police seven months ago, and served as a patrolman in the Temple Mount Unit. Promoted posthumously to the rank of First Sergeant, Shanan was buried in his home town on Friday, 14 July 2017. He is survived by his parents, a brother and three sisters.